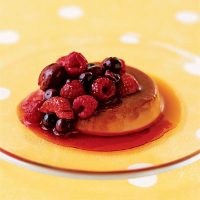 Round off your meal with vanilla-flavoured summer berries that have been gently baked in the oven. The fruits are also ideal served with double cream. Preheat the oven to 180°C, gas mark 4. Place the cherries and blueberries in a large, shallow, ovenproof dish. Sprinkle with the sugar and place the dish in the oven. Bake, uncovered, for 15 minutes. Stir in the strawberries and return the dish to the oven for 10-15 minutes, or until the fruits are tender and the juices begin to run. Remove the dish from the oven and stir the raspberries into the hot fruits. Cool for 10 minutes then spoon over the panna cotta. To make vanilla sugar, push a vanilla pod into a large jar of golden caster sugar. Leave for at least four days before using. Vanilla sugar can be used in many desserts such as rice pudding and crème anglaise. This dessert can be prepared ahead of time. Cook the fruits, allow to cool, then cover and keep in the fridge. Reheat the fruits in a moderate oven for 10 minutes before serving as above. Try the rest of this month's alfresco menu: Warm Salad with Tomato, Avocado and Mozzarella, and Caramelised Pork.